A sfGFP tagged M256I CysE inducible by arabinose. This part was subcloned and characterized in pSB3C5. This part is also available in pSB3C5. Please contact igemtrento[at]gmail.dot.com if you are interested in this part. CysE is a serine acetyltransferase that mediates the production of cysteine. More specifically, CysE catalyses the activation of L-serine by acetyl-CoA. Its product, 0-acetyl-L-serine (OAS), is then subsequently converted to L-cysteine by 0-acetyl-L-serine(thio1)lyase . Normally,the catalytic activity of CysE is sensitive to feedback inhibition by L-cysteine, but this is a mutated version (M256I) that have a 10-fold decrease in feedback inhibition by cysteine itself . FIGURE 1. CysE-sfGFP expression with different concentrations of arabinose, after 4 hours of induction. NEB10beta cells expressing BBa_K731040 in pSB3C5 were grown in LB broth until OD_600= 0.3 then centrifuged and resuspended in equal amount of minimal MOPS A medium (with 60mM glycerol as carbon source) and induced at OD_600 = 0.6 with arabinose. FIGURE 2. CysE-sfGFP expression with different concentrations of arabinose in presence or absence of glucose. For this test we used NEB10beta cells, expressing part BBa_K731040 in pSB3C5. The data shows the difference in expression levels when using glucose or glycerol as carbon source. MOPS A has 60mM glycerol as carbon source, MOPS B has 30mM glucose. Data relative to MOPS A are shown in orange, the ones relative MOPS B are in blue. 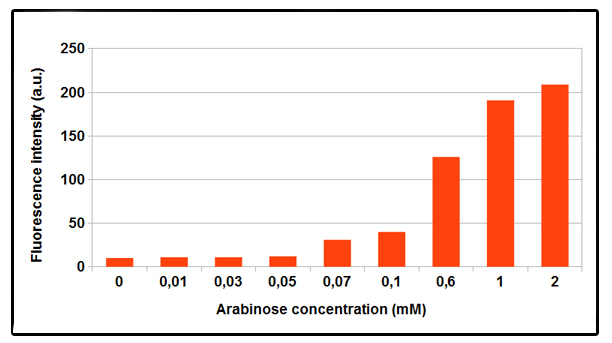 Expression levels in MOPS B with 5mM arabinose are very similar to levels in MOPS A with 0.1mM arabinose. FIGURE 3. CysE-sfGFP expression over time, after induction. The test was conducted in NEB10beta strain, with part BBa_K731040 in pSB3C5. Cells were grown in LB broth until OD_600= 0.3 then centrifuged and resuspended in equal amount of minimal MOPS media (A or B, in orange and blue respictively) and induced at OD_600 = 0.6 with 5mM arabinose.In absence of glucose, increasing linear expression over time of GFP is observed, while in MOPS B, in presence of glucose, expression levels are much lower. Jones-Mortimer, M.C. (1968). The control of sulphate reduction in Escherichia coli by O-acetyl-l-serine. Biochem. J. 106, 33-36. Kredich & Tomkins, (1966). The enzymic synthesis of L-cysteine in Escherichia coli and Salmonella typhimurium. Biochem. J. 241, 4955-4965.